FRENCH Islanders may have to wait more than two years before their complaints about the ferry service are tackled by the state government. Public Transport Victoria says it is considering re-tendering the ferry service, but not until the current contract expires in June 2017. The ferry which goes to Stony Point and Phillip Island services the island’s 123 permanent residents, although breakdowns and rough weather have led to claims of businesses losing money and schoolchildren being stranded on the mainland. Residents say they have been cut off from reliable access to Stony Point and Phillip Island “for more than two months”, disrupting their access to health services, food supplies, schools, social commitments and “the opportunity to make a living”. The PTV’s French Island Ferry Service Update, a newsletter sent to commuters, says calls for expressions of interest from ferry operators may be made later this year. The newsletter says the government will “consider” improving the Tankerton jetty breakwater. However, the project will join a list of outstanding works throughout the state. The cost of improvements to the jetty and breakwater would “run into millions, therefore funding this project needs to be considered in line with funding availability and other infrastructure priorities around the state”, the newsletter says. The PTV says its “first priority” is to get the principal ferry, the George Bass, back into the water after engine repairs. It is believed replacement engines are coming from Sweden. Another priority is to get its replacement vessel – the Schouten Passage – back into the water after its engine “blew” on Easter Monday. Last week, passengers were ferried across on a stop-gap vessel supplied by Western Port Fishing Charters. The PTV says it will continue to work with Parks Victoria on options for a north/south berthing option at Tankerton. It “apologises for the issues, challenges and isolation” to French Island residents caused by service disruptions after engine failures stopped the boats 22 February-10 March. “The service cancellations and ad hoc replacement services were not of an acceptable standard. PTV has been advised that the George Bass should be repaired (with two new engines plus gangway installation) by the end of April,” the PTV’s newsletter states. The ferry is the islanders’ usual link to the mainland. It is funded by PTV. “Despite numerous letters from islanders to PTV and the amazing support by our local member [Hastings MP] Neale Burgess, the amount of cancellations is increasing,” a resident – who did not want to be named – told The News. “There have been more than 70 cancellations in the past two months causing under aged children to get stuck on the mainland after school with no possibility of returning home – for days. “Imagine that your children cannot come home from school, in one case up to a week. It is believed PTV pays the operator more than $500,000 a year, but the service is not subject to performance standards that guarantee an all-weather ferry service. Manager Frank Denvir confirmed that he is “not required to use any particular type of vessel” (‘No ferry: islanders isolated’, The News, 10/3/15). Another source said the PTV had spent $750,000 on the service last year. 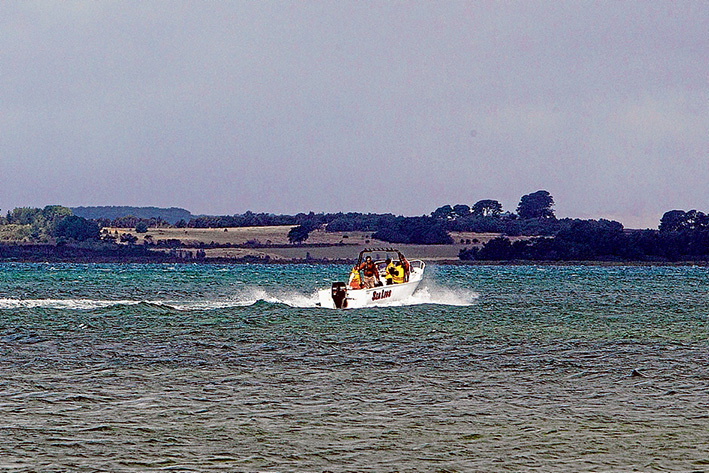 Inter Island Ferries Service in 2013 told Mr Burgess that it “has been fighting with Parks Victoria for years to fix the Tankerton jetty and dredge the Tankerton channel, but that [it] never seems to have the money and is too busy prioritising other projects, which they think are more important”. Mr Denvir said his ferries were up to one metre below the lowest landings of both the Tankerton and Cowes jetties and had “ongoing problems in getting people safely on and off”. He said he would prefer floating jetties at Tankerton and Cowes, but this would require an L-shaped rock formation to protect them from bad weather. Mr Burgess said French Island residents were being “held to ransom” by both the PTV and the operator. “It’s a disgrace. If this was in the city, say, at Docklands, it would be fixed straight away. People rely on this service yet the performance is atrocious. People can’t get to school or home again,” he said. Mr Burgess said Western Port residents were also being short-changed through intermittent train services to and from Stony Point. “The disgraceful thing is that the Tyabb level crossing is being manned for BlueScope trains but not for passenger trains,” he said. A WorkSafe Victoria spokeswoman said that under Victorian OH&S laws, employers were responsible for providing a safe workplace for employees and ensuring their work did not put the public at risk. A PTV spokesman said its contract with the operator “details many requirements in operating the ferry service, including the standard of the vessel, safety management plans, and that the services should be operated in a punctual way. “In the case of February/March when the operator had both ferries out of the water, contract payments were adjusted. “There are a number of operational and safety reasons one or more ferry services may be cancelled,” he said. “The ferry cannot operate in winds of 25 knots or greater. “The increase in cancellations in late February/early March was due to the operator experiencing breakdowns on both of his vessels on the same day. Mr Denvir refused to speak to The News last week, other than to say, “Any resident can come to me anytime and ask why the ferry is not running and I will tell them. If they investigate they will know why.